Is an April fools’ joke a good PR tool for your game? Traditionally, on every April 1st countless game makers pull off April fools’ jokes, with at least as many gamers and more importantly media laughing or complaining about them. This raises the question of whether cooking up an April fool’s joke could be more than just an enjoyable team building exercise, and actually be a strong PR tool for your game? The short answer: yes! Just kidding: like almost everything in PR it depends on circumstance. To try answer the above question more in-depth, we analysed some general data from this year’s jokes. We also examined four very different examples in greater detail. 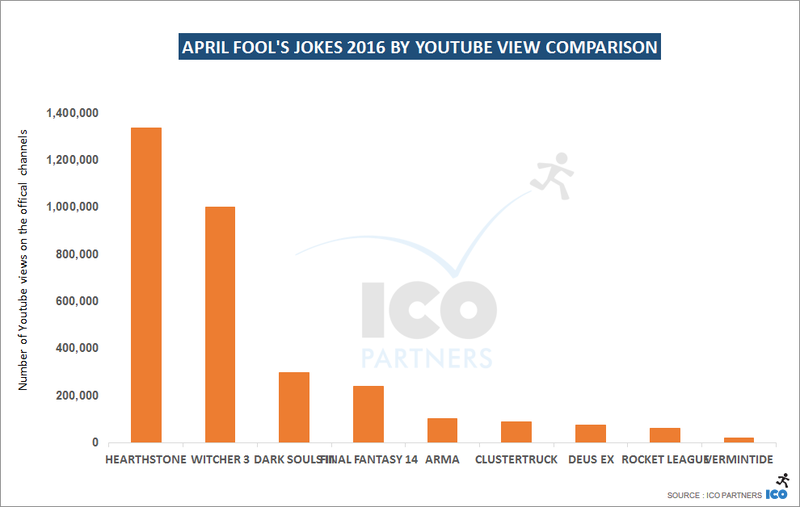 The data below should hopefully help you decide whether participating in next years April’s fool’s fun is worth your PR resources. In the graph below you can see the general ranking of this year’s April fools’ jokes according to how many articles they generated in media. For more info on the tracking method please read this entry. Please also note that this selection excludes several jokes – such as Hearthstones fake MMO – due to it being a too much of a generic name for our tool to track consistently. Furthermore, other stunts that didn’t get enough coverage to be tracked, were also excluded. If you are interested in what the actual joke for the games in the graph were, I have listed links to them at the very end at the article but now back to the coverage graph. Unsurprisingly, big brands like The Witcher 3 and Dark Souls III led the coverage charts. However, the fact that a small title like Clustertruck gained more traction than big brands like Final Fantasy 14 and most notably Rocket League, shows that a strong name doesn’t necessarily guarantee coverage when the idea or execution of the PR stunt isn’t quite right. In the four example case studies analysed, we take a look at what helped or hindered these stunts. But first let’s have a quick look at how the different games’ related videos performed on YouTube. As mention before we couldn’t track Hearthstone’s MMO joke in terms of coverage but it still included in the Youtube overview graph which it is leading – most likely due to Blizzard’s strong community. While Dark Souls III was a very hot topic in the number of articles it was featured in, it was far less popular on YouTube compared to the Witcher 3. One explanation for this could be that news outlets were eager to pick up on the Dark Souls III news, as the game was due to be released a week after. Therefore, references to Dark Souls III would most certainly generate traffic on articles. However, in reality the audience wasn’t too impressed by the video itself, leading to the smaller numbers of views. 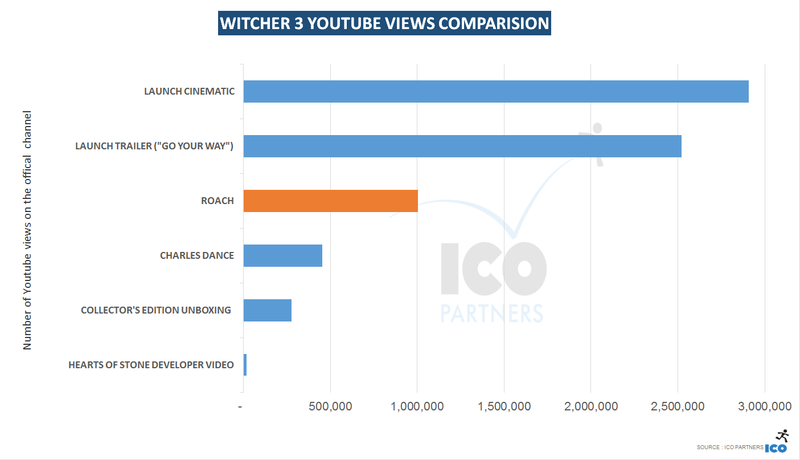 The big difference in coverage and YouTuber numbers could also be related to a variety of other factors, such as the Witcher 3 simply pushing video content more or having a stronger YouTube community. Lets look at our four, hand-picked examples in a bit more detail. The Witcher 3’s joke high ranking does not come as a surprise as it has a lot going for it: a massive brand; a good quality video; and, of course, a horse. What was missing, however, was any sort of content or interaction with the actual game. So by general metrics the Roach video was a huge success. 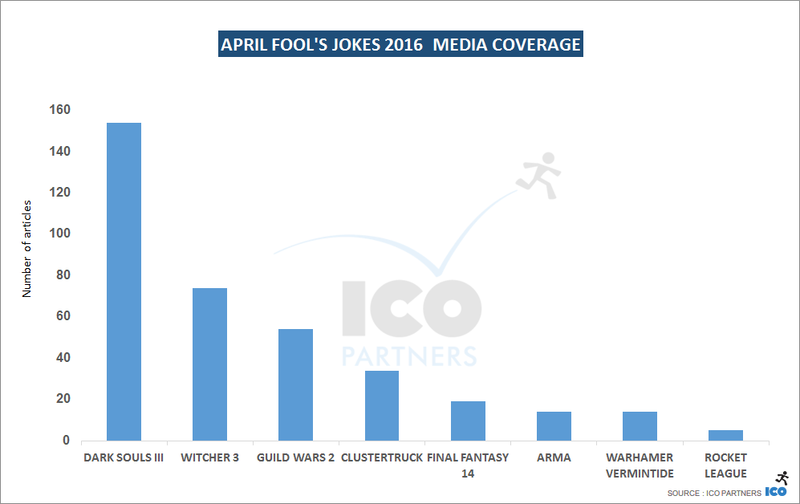 Comparing the Witcher to its own high standards, it becomes clear that the April fool’s joke wasn’t strongly picked up by press compared to other Witcher news beats from the last year as illustrated in the graph below. 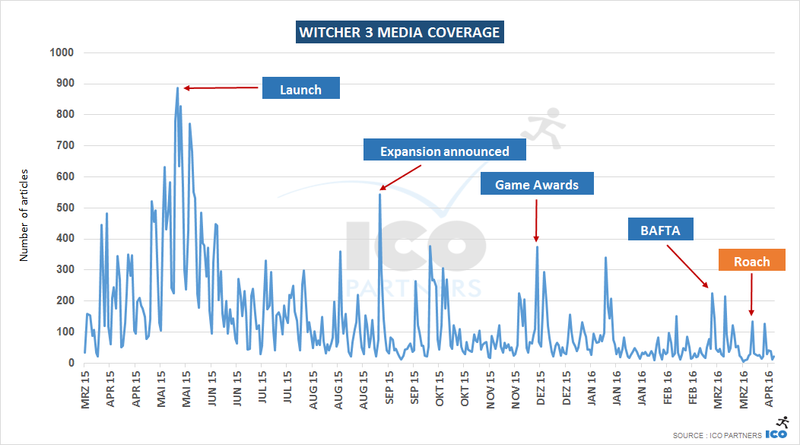 Sure, it caused a decent bump in coverage, but compared to other Witcher news beats, it wasn’t as impressive. Through looking at the Witcher’s YouTube channel however, it seems that CD Project Red had more success in reaching its YouTube audience with the April Fools’ joke. The video hit a little over a million views, which is pretty much exactly the average view count across all videos on the channel. The video also seemed to have resonated with the audience as 99% of the over 30,00 YouTube ratings were positive. It also got more views than for example a video of the unboxing of the special edition or a making of video featuring Charles Dance (Dad Lannister from Game of Thrones). If you follow my Twitter you will know I’m a big fan of tinybuild’s unconventional and often clever PR stunts. For April fool’s they managed to pull of an impressive joke for their game Clustertruck called SUPER TRUCK. The video alone managed to get 88.420 views on tinybuilds official YouTube channel. None of the other Clustertruck videos from developer Landfill Game’s reached such a high viewing number. Another very positive side effect of a playable April Fools’ joke is buzz from YouTubers. Just from a quick search of the first page of YouTube search results for “SUPER TRUCK” we spotted over 2 million additional views from additional Let’s Plays. A nice benefit that others – for example The Witcher’s Roach or the Hearthstone MMO – missed out on. Media coverage also turned out to be great for a relatively low profile game like Clustertruck, resulting in the biggest PR beat for the game until now. 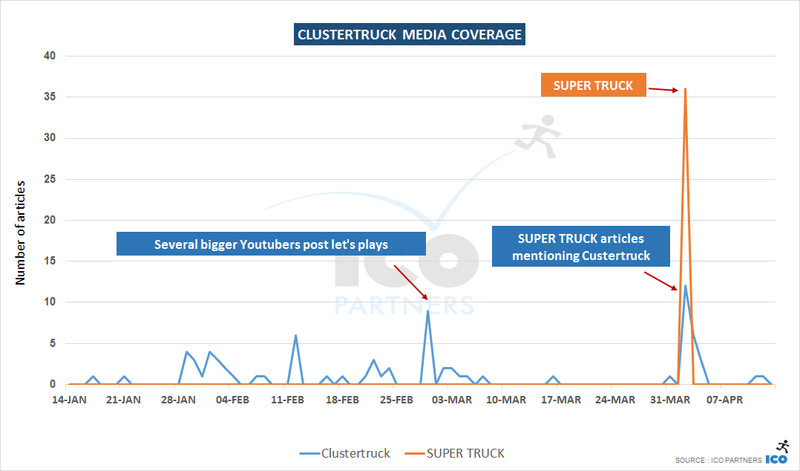 That being said, SUPER TRUCK alone generated nearly three times the amount of articles than articles about the April Fools’ joke that also mention the actual game Clustertruck, which might be both positive and negative. On the one hand, the lack of a clear and visible link between the two games may have resulted in the April Fool’s stunt looking less like a promotion, thus leading to more players’ interest. However, this doesn’t help Clustertruck as much as it could have in terms of brand awareness. 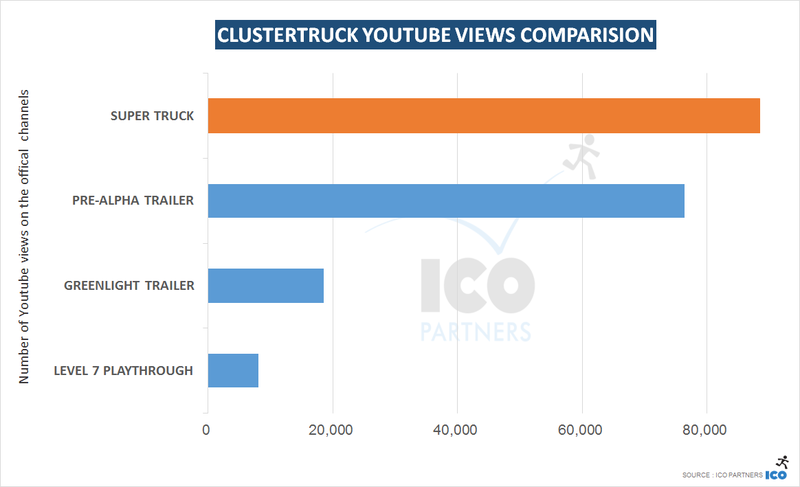 Either way, the joke is the biggest PR topic for Clustertruck so far and shows that with the right idea, a good asset, and something playable, an April fools has the potential to be a great PR booster for both press and YouTubers alike. 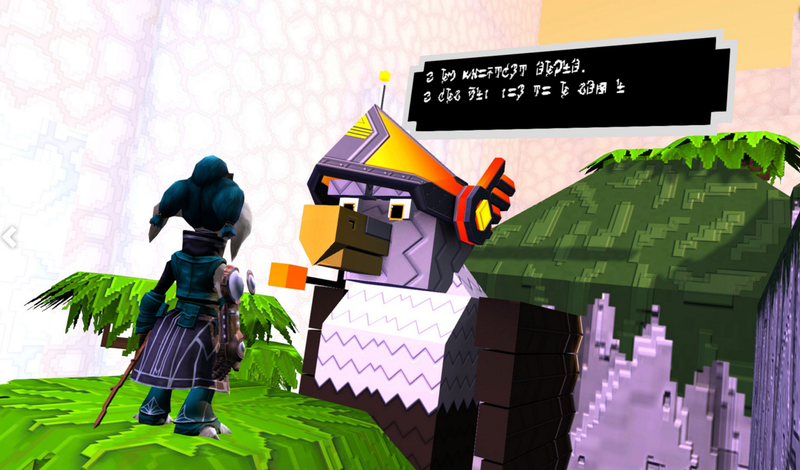 Guild Wars 2 has a tradition for April fool’s jokes of adding retro looking levels to the game. This years Super Adventure box missed a video (which was a bit of a shame in my opinion) but the actual new content in the game generated a very good amount of articles for the online game. Looking at Guild Wars 2 coverage from the last year it is clear that the game has been out for a while and it is getting a bit quieter around the title. 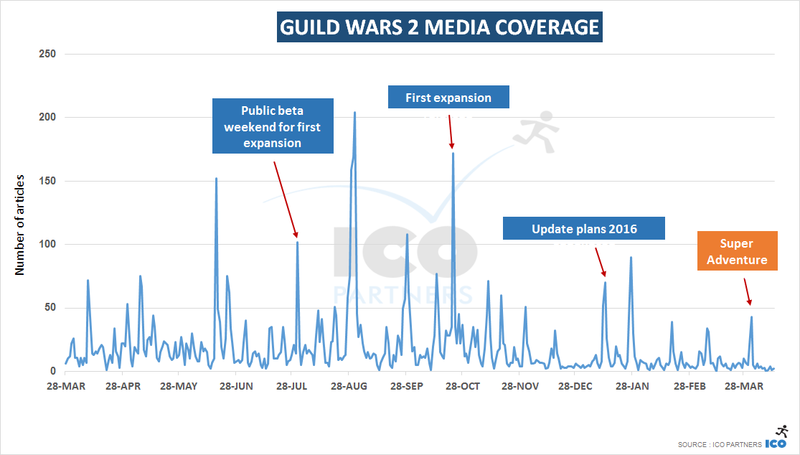 However, the in-game event managed to generate a nice media bump for the title that would have had most likely far less media impact if it wouldn’t have been placed on 1 April. Update: The Rocket League team have been in touch with and clarified this year’s April Fool’s prank was – unlike the assumption made by us and several other news outlets – not actually made by them, but rather a community site. Apologies for the misunderstanding to the Rocket League team and congratulations to the Rocket League Garage team. To my knowledge this is one of the few times a fan made April Fool’s joke has made it into several prank round-ups from gaming websites. April Fool is on us I guess! As mentioned above, getting media attention for an April Fools joke is no doubt easier with a bigger brand. However, our final case study, Rocket League, demonstrated clearly that even a huge name does not guarantee media attention. Rocket League’s video seemed a bit rushed, not very well thought-out, and most importantly not very funny. That is also reflected in the media coverage for the trailer, which hovered somewhere in the single to low double digit numbers, whereas more successful news beats for the game generated several hundred articles. 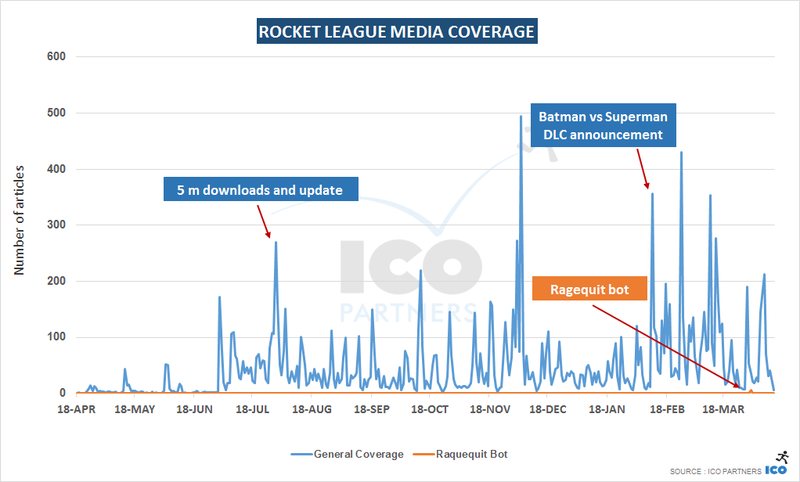 As Rocket League was also featured on several other topics that day, the low performance of the Ragequit bot video is not very apparent in the coverage graph above. To make it more visible, we decided to display it in a separate line in the graph. 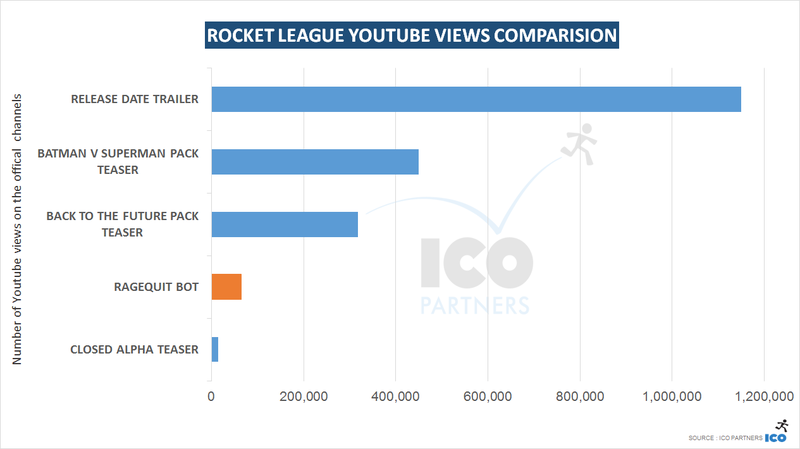 On the YouTube front, the video didn’t generate great viewing numbers for the Rocket League community. It should be pointed out however that the video was not featured on the main YouTube channel of Rocket League, but instead on a community channel. On average a video on the Rocket League main channel gets 173.613 views, and the community channel 115.404 views; the Ragequit Bot only managed to get 64.254 views, meaning that it under-performed in direct comparison. To conclude, we wrote up five rules to keep in mind if you try to run an April fool’s joke next year. … but even if taken seriously, then make sure the announcement can’t be seen as a negative. If you don’t have good ideas, don’t do a prank announcement. Better nothing than something lame. Announce your prank before 12:00 pm. Late jokes seem out of place and miss round up featuring. If you manage to have something that is playable, do it. It works for Let’s Plays videos, it can get you tons of extra views; but it will get better effect overall. https://icopartners.com/newblog/wp-content/uploads/2016/04/april_banner-3.png 256 710 Thomas Reisenegger http://icopartners.com/newblog/wp-content/uploads/2017/08/ICO_logo_022.png Thomas Reisenegger2016-04-14 13:20:362016-09-26 22:52:38Is an April fools’ joke a good PR tool for your game?